So, I'm sure you all have at least heard of this new DCOM (Disney Channel Original Movie) that graced our screens on July 31st. Whether you'll like it or not is entirely up to you. But I figured I should at least give a rundown for those who haven't seen it yet. That way, they can decide for themselves. For an extended trailer, which I prefer (but is more spoilerish), look here. As seen in the trailer, Belle and Beast's son, Ben, is approaching his sixteenth birthday... and his coronation as king. And his first proclamation? He wants to bring the children of the adults' sworn enemies off the Isle of the Lost, back to Auradon. Because, as he says, "the children are innocent", so why not give them a chance to learn to be good? Of course, this is a shock to his parents. Can the children of Maleficent, Evil Queen, Jafar, and Cruella really learn to be good? Or will they live up to their parents' reputations and secure their place in villian history? Personally, I liked it... though I can see why some don't or wouldn't. It's interesting, different, and I thought they pulled it off well. 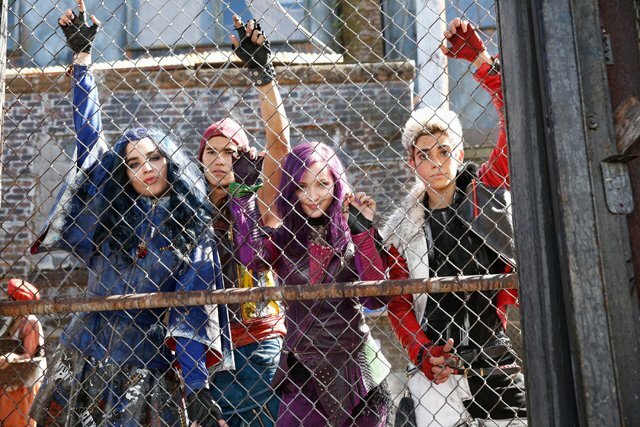 b) Dove Cameron as Mal, the above villian's daughter. One of Disney's current stars, I thought she did a great job showing every stage the girl went through. c) Cameron Boyce as Carlos, Cruella's son. I've always found him funny (in Jessie and Gamer's Guide to Pretty Much Everything), so I was happy when I heard he was in it. And not only was his humor there, but the vulnerability he showed as Carlos was absolutely endearing. d) Kathy Najimy... I recognize the name, but for the life of me can't place her. But it was nice having another well-known admist the unknowns. Favorite characters? As much as I love all of them, I'd have to say Evie and Carlos. It's a little hard to quite pinpoint why without spoilers, but there ya go. 1) Some might say it could have been arranged or written better. 2) It's cheesy, as most DCOM's are. 4) Although I like them, I know not everyone likes musicals. Is it my absolute favorite DCOM I've ever seen? No, but it's cute and has a good message. Even if things aren't perfect, I don't really care. The heart and catchy songs outweigh the bad points for me. For you it might be different. But I guess you'll never know til you give it a chance! Have you seen it? If so, what did you think? If you haven't, let me know why you are or aren't planning to watch it. I've got to check out this show! It sounds really fun. It sounds like a really cute movie. Yeah, Disney Channel does get cheesy, but it's produced a few gems!